Originally discouraged by the nuns at her school from taking the PSAT, Dynarski later took the SAT and found she was remarkably good at taking tests. Her scores and smarts won her a spot at Harvard, and the financial aid package Harvard offered made it her least expensive option. But as generous as Harvard was to talented, low-income students, it was also a place where Dynarski would become acutely aware of her own socioeconomic disadvantages. Dynarski recalls getting two work-study job options at Harvard: cleaning toilets or washing dishes. Not surprisingly, she chose the dishes, and remembers how quickly it served to divide the classes. Once, after a long shift in the dining hall, Dynarski heard her dorm-mates make a friendly wager over the meaning of a word. “They were betting more than I had just earned and I blew up at them,” she says; her dorm-mates took her out to dinner by way of apology. Dynarski’s father was a high school dropout, and her mother had only taken a few college-level night classes while Dynarski was in high school (her mother never finished the degree). So Dynarski was on her own navigating the Ivy League school experience. In a single semester, she loaded up on an array of tough courses—calculus, physics, chemistry, computer science—and nearly flunked out. “The dropout rate for first-gens is twice that of other kids,” Dynarski says now, citing research she conducted with Martha Bailey, an associate professor of economics at U-M.
Fortunately, Dynarski would persevere and would eventually give up her work-study post to take a part-time job organizing Harvard’s clerical staff for a union. It was the best move she could have made. “In an alien place, the union staff provided a nurturing, supportive community,” she says. And the union work was equally formative, exposing Dynarski to the powerful role unions can play in driving economic and social mobility. After six years as a union organizer, Dynarski returned to Harvard to pursue a graduate degree in public policy, which offers the means to bring about large-scale change. The degree allowed Dynarski to pursue her profound and growing interest in inequality, while teaching her to like some of the more rigorous quantitative courses—like economics and statistics—that had nearly derailed her as an undergraduate student. Dynarski would go on to pursue a PhD in economics from MIT, where she found new ways to illuminate educational disparities through the powerful analytic tools of her discipline. Dynarski’s doctoral thesis, for example, took advantage of a shift in policy to study the effects of financial aid on college access and completion among low-income students (the work was later published by the American Economic Review). Subsequent papers have explored the impact of merit-based aid, the most effective charter school practices, the cost of complexity in the federal financial aid application, rising inequality in higher education, and more. Sensing a theme? You should be. Dynarski’s experience as a first-generation, low-income college student was challenging, but enlightening. There’s a sensitivity—a vitally important perspective—that comes from being a first-generation college student, says Dynarski. Someone who never had to struggle to overcome hurdles might not think to explore them. Those struggles inform your theories, and drive your research agenda. And important new discoveries can emerge. They certainly have for Dynarski. 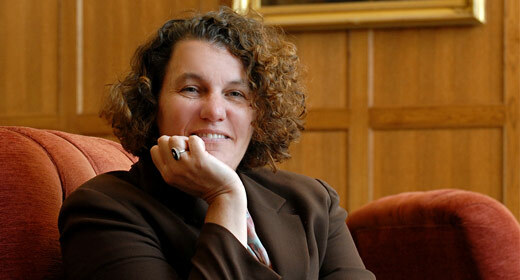 Last fall, the Chronicle of Higher Education commended Dynarski for shaking up higher ed “in the classroom, on campus, and beyond.” Calling her one of the top ten influencers and agitators of 2015, the Chronicle cited Dynarski’s many contributions to The New York Times as a factor (Dynarski has penned eight columns for the print edition, and many more for the paper’s online policy and politics enterprise, The Upshot). But Dynarski has done far more. Behind the scenes, Dynarski, Brian Jacob, and others at the Ford School’s Education Policy Initiative have spent years building a secure longitudinal database that combines student-level data with program data and outcomes. They’ve also spent countless hours training a growing cadre of master’s, doctoral, and post-doctoral scholars to use data like these to tease out the causal effects of policies and practices. More publicly, Dynarski has dedicated hundreds of hours, and racked up an impressive number of frequent-flyer miles, working with policymakers and practitioners in Washington, DC to revamp the financial aid application process so it’s less of a barrier for first-generation college students. Dynarski’s research and subsequent policy briefs and proposals have already inspired several improvements that are making applications shorter and simpler, and saving time for families, colleges, and the federal government alike. Recently, her work also inspired a bipartisan bill, introduced by Senators Lamar Alexander (R-Tenn) and Michael Bennet (D-Colo), that seeks to replace the 100+ question FAFSA with a two-question form. Back at the University of Michigan, Dynarski has worked with staff and administrators to design U-M’s new HAIL Scholarship pilot for low-income students. The program, launched this fall, attempts to remove real and perceived barriers to higher ed for low-income students across the state. “Sue Dynarski’s collaboration on the HAIL Scholarship program is helping us reach talented students in all communities in Michigan,” says University of Michigan President Mark Schlissel, who speaks about the program often and enthusiastically. It will take time to analyze the impact of U-M’s HAIL Scholarship pilot. But the hope, says Dynarski, is to expand the number of high-achieving students from disadvantaged backgrounds who consider, apply to, attend, and ultimately graduate from the state’s first and flagship university—ours. “People from different backgrounds, and the experiences they’ve had, enrich academic research and public policy. And first-gen students bring important perspectives,” says Dynarski. Below is a formatted version of this article from State & Hill, the magazine of the Ford School. View the entire Spring 2016 State & Hill here.